There are a few things that can actually get me more excited than Chocolate. And one of those things happens to be Stationary. You can never ever have enough really. Just ask all my previous employers. So when I was approached to take the Inkjoy™ Challenge by comparing Papermate's new range of Inkjoy™ 100 pens with my current ballpoint well, I could hardly say no could I? I mean look at them? Look at those vibrant colours? They are available in a medium point in black, blue, red, purple, green, orange, turquoise, magenta, brown and lime. Papermate claims that the Inkjoy™ pens feature a revolutionary writing system, giving the best in effortless writing. So I put the pens to the test. The pens feature a triangular shape so they are really comfortable to write with and it is true, they are a lot smoother to write with then your average ball point pen. I don’t normally use a ballpoint but these Inkjoys™ blur the line between ballpoint and a rollerball. They are very smooth and great value at 45c each. I think that making the pens “smoother” means a little more ink on the page, and a smoother ink in the barrel. However, there was no sign of any smudges at all. However, I wonder how they go with my ultimate test? Doodling? Yes, you read right. I always use my pens to doodle when on the phone or when I am meant to be meeting an important deadline, don't you? In a two minute phone call I drew the following doodles using the pens. They were great to draw with as well. 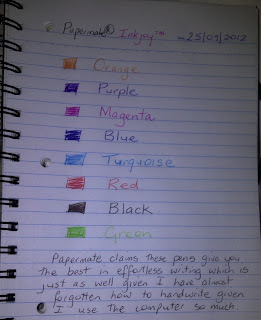 There was no leakage of ink and I love the range of colours, especially the purple, hot pink and orange. 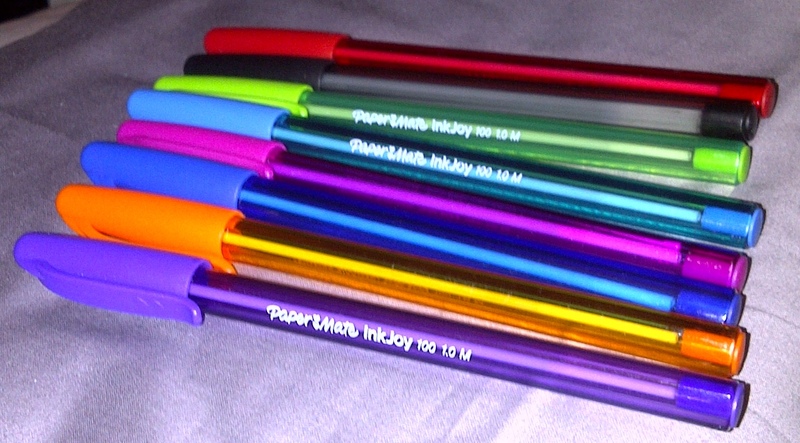 And luckily for you, Papermate has given me a set of 8 pens to give away to one of my readers so they can take the Inkjoy™ challenge as well. AND, we all know you can't have great pens if you have nothing to write on, true? So, the winner will also receive a gift voucher for one of the Diary Planners that I reviewed last week on behalf of the innovative Australian company, Personal Planner. 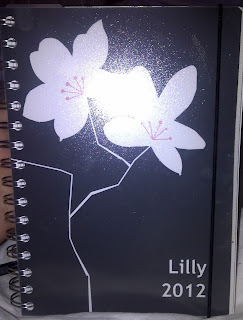 The winner will get to design their very own planner. The content, the colour, images, period covered, the integration of special dates, words.....will be all yours to decide. Here is a reminder of the one I made. It is open to Australian residents only and entries close at midnight on Saturday 13 October 2012. 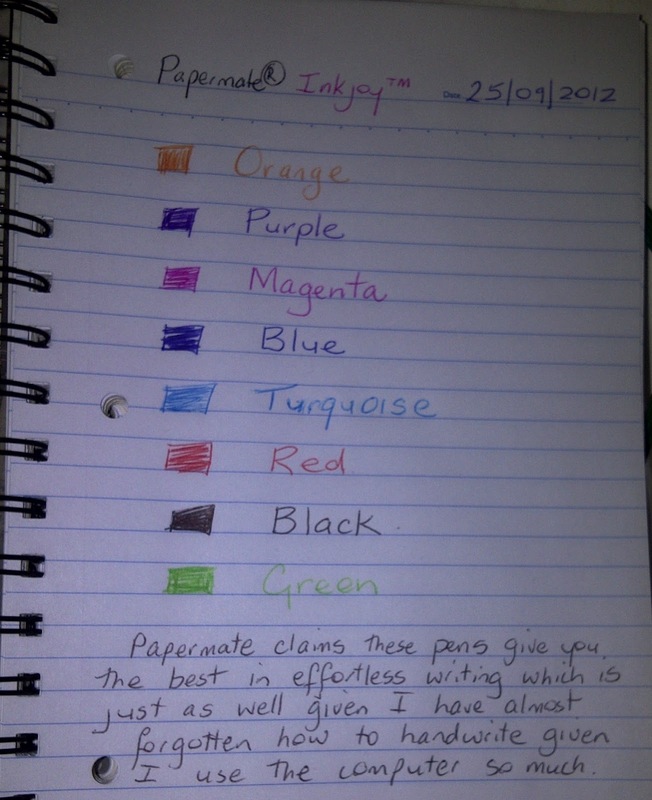 Note: I received no payment from Papermate or its associates for this review. I was given a set of Inkjoy pens in order to review the product and another set to giveaway to one of my readers. The views expressed in this post are entirely my own.